Here is an other analysis of a spot made by Paul PA0K on February 1st 2019. He was spotted by W4HOD over 7200 km with a SNR of -23 dB. This spot reveals, that the propagation, between Paul's station and W4HOD, was not good, at that moment. But never the less, Paul's signal was received, with a bit of luck, as we will see. The table shows all the stations, that were received by W4HOD in Alabama in the time slot of 13:12 UTC. I have sorted the spots by propagation, using the Lowest Possible Power (LPP). 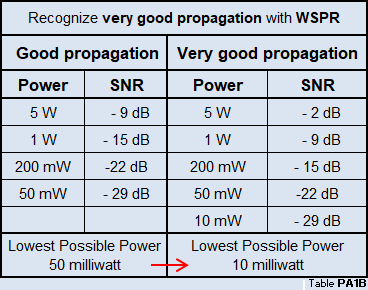 The lower the Lowest Possible Power, the better the propagation. The propagation to W4HOD was good, or even very good, for the first 9 stations in the table. 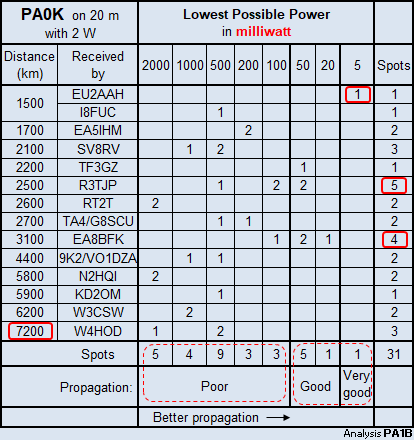 This are the stations that have been spotted with a LPP of 50 milliwatt or less. The propagation from Paul's QTH to W4HOD was poor with a LPP of 500 mW. W4HOD also received PA1OSF over a distance of 7200 km from The Netherlands. PA1OSF was received with a LPP of 20 mW. The propagation from PA1OSF was 17 dB better than from PA0K. The distance between PA0K and PA1OSF is 71 km (44 mi). The difference can be caused by propagation, antenna direction and the antenna. 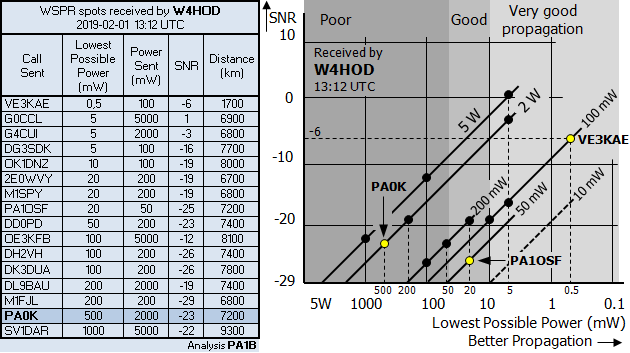 The propagation between VE3KAE and W4HOD shows the best propagation with a LPP (lowest possible power) of 0.5 mW. Luckely for Paul, VE3KAE used 100 mW. Believe it or not, if VE3KAE had used 5 W, in stead of 100 mW, this signal would have used a large part of the dynamic range of the receiver of W4HOD and Paul's signal would probably not have been spotted. I noticed that W4HOD received twice the number of spots compared other stations. In an analysis of frequencies that were used, I saw, that W4HOD can receive two signals a few Hz apart. This suggests that there are more than one WSPR receiver or detector at W4HOD. The dynamic range of the SNR is +1 -(-26) = 27 dB. The dynamic range in LPP is 1000/0.5 =2000, which is 33 dB. Here is a further analysis of spots made by Paul PA0K on February 1st 2019. The propagation was not that good. But Paul's signal was earsplitting into Belarus. He was spotted by EU2AAH over 1500 km with a SNR of -3 dB. This spot reveals, that the propagation, between Paul's station and EU2AAH, was very good, at that moment. I developed the Lowest Possible Power diagram, to compare spots, that are made with different power. The Lowest Possible Power diagram shows instantly, how good the propagation is. A spot is placed on the diagonal line of the power, that is used by the transmitting station. The height of the spot in the diagram is determined by the SNR of that spot. You can read the Lowest Possible Power of a spot, on the horizontal axis. The better the propagation, the lower the value of the Lowest Possible Power. This diagram shows all stations, that were spotted by EU2AAH in the time slot of 13:52 UTC. It can be seen instantly that 3 station were received with good propagation and 2 with very good propagation. The letter gives the DXCC of the spot. Paul's signal (PA0K) was the strongest signal, with a SNR of -3 dB. The arrow to the horizontal axis points to a Lowest Possible Power of 5 milliwatt. 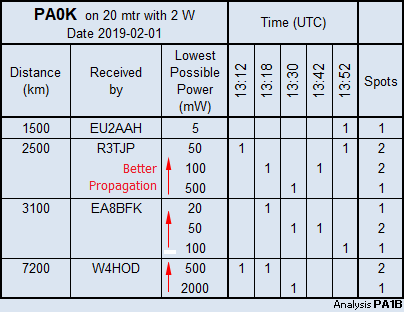 The LPP of 5 mW is in the area of very good propagation. 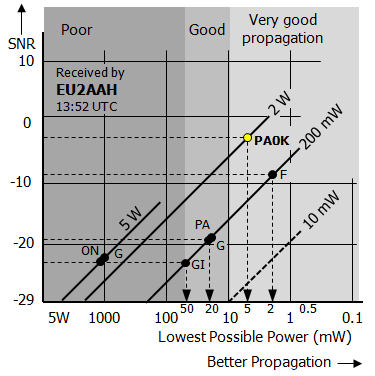 The propagation between F6KOP (F in the diagram) and EU2AAH is even better, with a LPP (lowest possible power) of 2 mW. The dashed line in the LPP diagram is the diagonal line for a power of 10 milliwatt. PA0K and F6KOP could also be spotted if they would use a power of 10 milliwatt. If PA0K would reduce from 2 Watt to 10 milliwatt, his signal would be received with a SNR of -26 dB. F6KOP would be received with a SNR of -22 dB with a power of 10 milliwatt. This is the table, that I used to draw the LPP diagram. 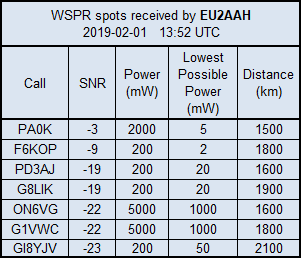 With this table you can immediately judge the propagation from your WSPR spots. or higher, the propagation is very good. If you notice that the propagation is very good, consider to reduce your power. A WSPR beacon with a power of 10 milliwatt, will ONLY be spotted, when the propagation is very good. WSPR with 10 milliwatt can be compared with a CW beacon with a power of 200 milliwatt.